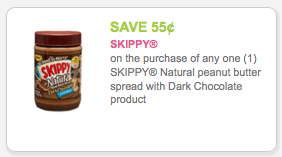 $0.55/1 Skippy Natural PB w/ Dark Chocolate = $0.90 at Price Chopper! $0.55/1 Skippy Natural PB w/ Dark Chocolate - use zip code 12020. Skippy Naturals Peanut Butter is on sale for $2 at Price Chopper = $0.90! On sale for $1.77 at ShopRite = $0.67!